REDUCED .. VIEW .. 1 ACRE.. Highpoint Equestrian Estate. Gorgeous level entry custom built home Note the fine quality, and the elegance, warmth & comfort. in every detail of this home which is situated in the center of a lovely 1 acre property. Offering privacy, serenity & spectacular 180' panorama views of mountains & meadows., both living levels open to level patios, lawns, cascading water feature, and are surrounded by artful, meticulous landscaping for relaxed outdoor living. Pella windows & doors. 10' ceilings on both levels + 12' living room ceiling. Wheel chair friendly with elevator. 3 BBQ zones, 5 fireplaces, surround sound. Private access to legal 1 bdr. suite which can easily be connected with main house lower level, lots of storage, 12X20 workshop, sophisticated mechanical, Pure water filter system throughout, wine cellar. 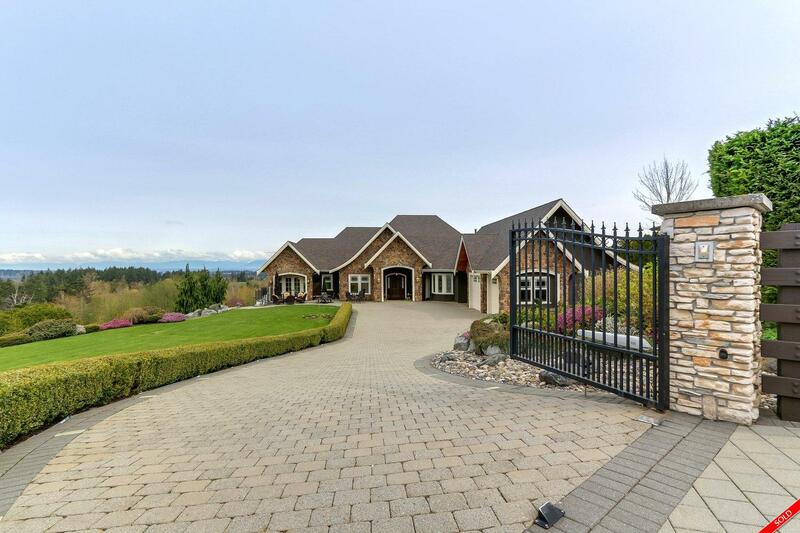 Easy access to White Rock, South Surrey & US cross border shopping. This thoughtfully planned home is designed to satisfy both your family and extended family needs. Motivated Seller.